King Agamemnon sacrifices his daughter Iphigenia to appease the wrath of the goddess Artemis (Roman Diana). The girl is dragged to the altar by a pair of soldiers. Her parents stand to either side, the grieving Clytemnestra on the left and father Agamemnon on the right. In the heavens above Artemis summons one of her Nymphs to deliver a stag as a sacrificial substitute for the girl. 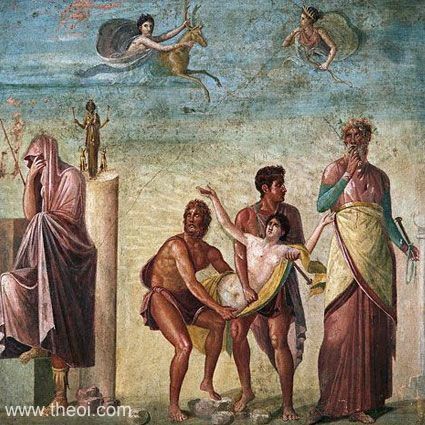 The fresco is perhaps based on C4th B.C. painting by the Greek artist Timanthus.